Hello, I loved your first book, you have no idea how many books I try to find about showing cows at the fair that really bring the whole real fair experience together, trust me I would know I show too! 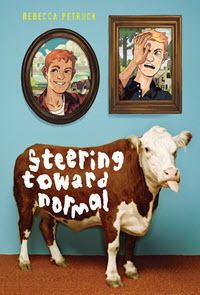 But I would really like a second book to go along with your first book Steering towards normal. It ended and I have so many unanswered questions! What happens to Jason and Crystal? Will they make Diggy the third wheel and leave him? Will Wayne sow next year and move back in with his dad or maybe Graf moves in with Pop, Wayne, and Diggy. And What about July, what happens to her and that guy she was with, and on top of that will Diggy take over the State Fair title that he lost this year? And personally I think that maybe if July goes away and doesnt really show up in the next book the next love interest for Wayne AND Diggy should be a girl who shows dairy cows, is the same age as them, and is a huge tomboy. I mean July was kind of tomboy but I would have rather have seen her hunting or fishing or have a chevy truck :). Just ideas, my brother and I both read it and we can’t wait for you to hopefully make another one! Just some ideas and thoughts, thanks Libby P.S. I thought the book sounded so much like my 4-H experiences in the cattle barn and besides it would be different for the beef and dairy to cross, like a Romeo and Juliet thing where it is almost forbidden in 4-H to go out with the other cow people. Authors love these notes, and we’re always happy to pass them along, if you can’t find another way of contacting the author. I still remember writing to some of my favorite authors as a kid, in the wayback days before Twitter and Facebook or even email. Handwritten letters mailed c/o the publisher, to Francine Pascal and Susan Kay. And while I can’t remember a response, I loved reaching out nonetheless. Did you even write to an author when you were younger? Get a cool response? Leave a comment! ← THE WEIGHT OF ZERO in Seventeen Magazine!